West Ham have signed full-back Sam Byram from Leeds United for an undisclosed fee. The 22-year-old had been in talks with Everton, but has instead signed a four-and-a-half-year deal with the Hammers. 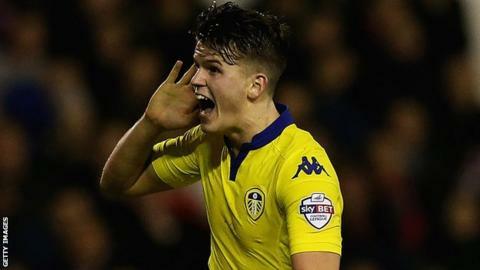 "I'm unbelievably proud and happy to join a club as big as this," said Essex-born Byram, who turned down a new contract with Leeds. "I'm just looking forward to what the future holds and hopefully I can achieve things with the team." Byram joined the Leeds academy set-up at the age of 11 and made his professional debut in August 2012. He leaves Elland Road after making 143 appearances and scoring 10 goals. "I spoke to the manager and he is one of the main reasons which attracted me to West Ham," Byram said of Hammers boss Slaven Bilic. "I think he's done unbelievably well with his team so far, so I'm really looking forward to working with him and his staff. "My uncle and my cousin are big West Ham fans and have bought their tickets for the new stadium. My uncle was down here yesterday getting a shirt with my name on the back."